“It must relax you to play music,” one of my Modesto acupuncture/Botox patients said to me today. I’ve always wondered what that means. For the most part, I think I disagree. But it’s not wrong either. I think perhaps it’s that very rare feeling when all the hard work comes together and then all of a sudden one loses themselves and becomes the music. It’s as if one takes their own sense of “self” and all of its worries and transforms that into the soul of the music and thus a sense of relaxation is achieved. But that’s a rare moment for me. For the most part, it’s the frustration, challenges and the eventual achievement of musical understanding which attract me to the practice of piano. Gosh, I got asked some of these question as part of a student’s Modesto school assignment. I’m not sure I answered them well enough, but I thought I’d share here. It was supposed to be an interview, but due to time constraints, I thought it would be best as an email type conversation. 1: Do you believe music has a significant effect on the brain? If so could you please explain. Definitely in both listening to music and producing the music. I think that we all have experienced changes in mood from listening to music. Perhaps even reduction of stress, or even a feeling of excitement or even violence. These changes are present when listening to the music. I think further changes are found when producing the music – such as playing an instrument. I think at any age, playing an instrument challenges the brain to form new connections. Perhaps for youngsters, this could lead to better math skills or better communication skills. And perhaps for adults it could be a way to keep our minds young. There has been scientific studies regarding physical changes in the brain produced by learning musical instruments at a young age – such as cortical thickening in certain focal areas of the brain. And there has been research which mentions that a person’s sense of sound discrimination may resist decline if one was exposed to some sort of early musical education. For me, I think just the challenge of playing music has made my mind sharper. I played violin while I was younger and kept it up till I was in my mid 20’s. I probably tried to practice about 1-2 hours per day. The practicing started dwindling when I got closer and closer to medical school. I personally developed a hearing problem in my college years and that made violin practice somewhat unpleasant. For me practicing the violin just became a way of life. But I gradually replaced that time with time spent studying medicine. 2: How does age and gender play a role in in music and the brain? I’m not entirely sure that gender plays a role in music. I have not personally done laboratory research on brain difference between genders. But I do think that a younger brain can adapt, change, and benefit more from an early music education. I’m not sure if you’re asking about playing music or listening to music. But either way, I’m not sure. This is a very interesting question. But I think gender questions are always tricky and there will always be exceptions in either gender – all we can make are generalizations in this research. 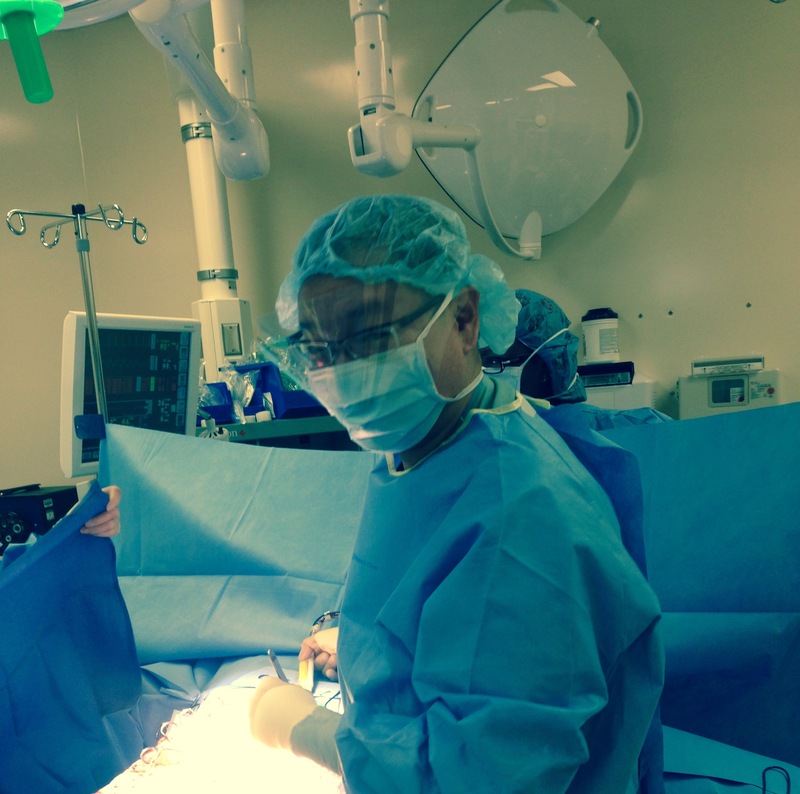 There is some discussion about the differences between women and male surgeons. My wife, Dr. Tammy Wu, who is a plastic surgeon often feels that women make better surgeons because of smaller hands, but she’s probably just saying that to annoy me. My hands are quite small too – perfect for many surgeon options. I can make smaller incisions! In the end, it’s probably similar to asking about math or language and the brain and gender. There are differences. But in the end – I don’t think it matters – it just becomes an academic observation and debate. 3: What role has music played in your life? I think it helped open doors to connections with other very interesting people. This networking via a common hobby has become very useful. I think opportunities are more abundant this way. I am now learning piano, an instrument I played briefly when I was a child. It helps give me a sense of satisfaction – where I’m improving and learning new pieces. I enjoy learning new pieces of music and making them my own. It’s especially satisfying when I have the pieces memorized and I can play it for others. I also feel that I am on a mission to spread music to others – especially classical music. My violin playing gave me a sense of who I am, or who I was. I was the concertmaster at Brown University for several years. I was also concertmaster of an orchestra at Harvard. It gave me a sense of accomplishment and confidence. I think this confidence exudes into other aspect of my life. It made me happier and ready to tackle challenges. 4: Do you play music in your office, for your patients at all to affect their recovery in any way? I haven’t gotten that sophisticated. I think it would be interesting to do. But sometimes we play music for the acupuncture patients and for the Botox patients while they are getting treatment. I have chosen music that soothes and perhaps they would feel less anxious and ultimately less pain while in our surgical / Botox / acupuncture office. And with less pain, the recovery is usually much better (faster, less complaints, etc). Click the picture below for an enlarged version. Text link of the article about early music lessons and how it benefited me as a Surgeon and Botox injector in Modesto, California. A former classmate of mine who is now on the board of a school in New York asked if I’d write a few words to her board about the importance of music education. I decided to write this article which eventually got published in a Modesto, California area magazine. 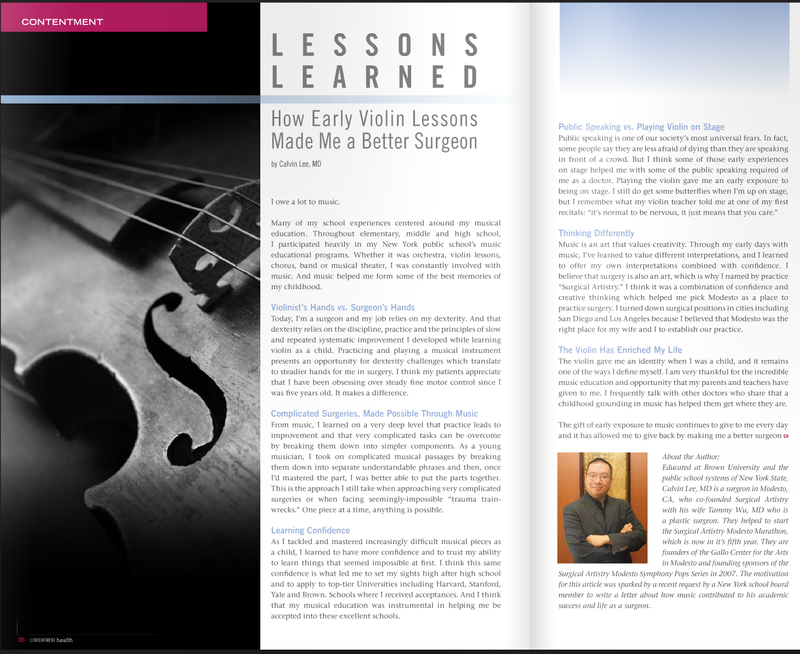 I do feel that music education is one of the most important pieces of my young life which helped me develop into who I am today, and it helps me throughout all the things I do as a Surgeon, Acupuncturist, and Botox injector.